昔In the summertime of old Japan, when the oppressive heat and humidity rendered daylight activity all but unbearable, people longed for the night and the scant relief brought by the setting sun. There, amidst a chorus of frogs and insects serenading the coming Obon, the people would play Hyakumonogatari Kaidankai (百物語怪談会), or A Gathering of 100 Weird Tales, and silently the spirits would return. 100 candles would be placed in a circle, and the players would each tell a ghoulish tale, often a story from their local village, or perhaps a more personal experience. As each tale ended, the storyteller would douse a single candle, the light slowly fading as the tension rose. The game was said to be a ritual of evocation, the expiration of each story and each candle summoning more spiritual energy, transforming the room into a beacon for the dead. With the vanishing of the final light, someone or something terrible would be waiting in the darkness. While no one knows exactly how Hyakumonogatari Kaidan-kai came to be played, it is believed that the game was originally created by the samurai as a test of courage, to see who was brave enough to withstand the gruesome tales and who would succumb and shiver when the final light was doused. A version of the game is described as early as in the kaidan-shu Tonoigusa (1660) which is also known as Otogi Monogatari (Nursery Tales). Written by Ansei Ogita (?-1669), Tonoigusa follows an innovative format, telling the story of several young samurai who get together to play Hyakumonogatari Kaidan-kai. Each tells a tale in succession and at the extinguishing of the final candle a giant hand appears to come down on them from above. With a quick swipe of a sword however, the hand is revealed to be the shadow of a spider and those who shuddered in fear are held up to mockery. Spreading in popularity, Hyakumonogatari Kaidan-kai slowly found its way down from the aristocratic warrior class to the working classes of peasants and townspeople, until it was known and played everywhere in Japan. Played over and over again, people were on the lookout for new kaidan to relate that would impress and shock the other members of the gathering. It wouldn’t do to be the boring guest who tells the same stories over and over again, or something that had already been heard at a previous gathering. Where there is demand, supply soon follows, and a cottage industry sprang up to take advantage of this. Special kaidan-shu were published, designed to provide stories for the game. Later, many of these kaidan-shu books even had the word “hyakumonogatari” (“100 Tales”) in the title, and were of varying quality, produced quickly to meet a need rather than satisfy any sort of artistry. The first book to use the name hyakumonogatari was published in 1677, and was called the Shokoku Hyakumonogatari, (100 Tales of Many Countries). As suggested by the title, it gathered together the mysterious tales from several countries, claiming that they were provable by the people who wrote them. Like in The Ghost of Oyuki, the “from life” aspect of these collections was a powerful selling point, appealing to the public’s taste for true kaidan and yūrei tales. All kaidan-shu claimed to be true stories, and there was no question amongst Edo period Japanese regarding the existence of the supernatural. 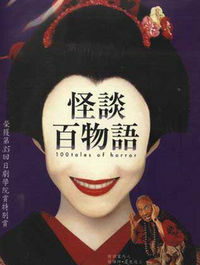 The various yūrei and yōkai stories were taken at face value. Many of the entries explained some local phenomenon, perhaps an oddly shaped rock or an ominous tree at the local shrine that refused to bend or sway in strong winds. Kaidan in a kaidan-shu collection were often very short, without a beginning or an end but merely recording some strange occurrence that they had seen or heard of. After the Shokoku Hyakumonogatari came many other similar books, such as the Shokoku Shin Hyakumonogatari (New 100 Tales of Many Countries), the Osogi Hyakumonogatari (100 Tales of Osogi), the Taihei Hyakumonogatari (100 Tales of Peace), the Bansei Hyakumonogatari (100 Tales of Eternity). All of them used the term hyakumonogatari in the title, and all of them hoped to capitalize on the reading public’s fascination and frenzy. Writers scoured Japan for grisly legends and folktales, climbing up the tallest mountains, through the darkest forests, hunting out the most remote villages looking for horror, trying to be the first to get them into printed format. Yūrei-e artists supplied the illustrations. 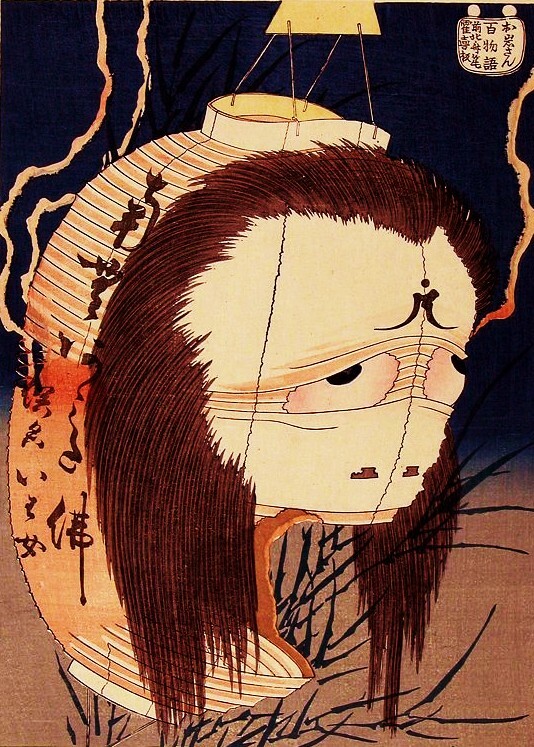 The vast majority of the yūrei and yōkai stories and images known today came from this period, and they still form the spine of Japanese horror storytelling. This was the Golden Age of the kaidan. Trackback: Fun Link Friday: Translated Japanese Ghost Stories « What can I do with a B.A. in Japanese Studies? Fascinating!! I love your blog. It is so enjoyable. Many thanks. Thank you! I checked out your photoboothjournal blog, and it is also very enjoyable! What an interesting hobby. Have you ever been to Japan? Photobooths there are on a whole different level. Great site! I enjoyed reading it and added your link to a blog post of mine. Thanks Ledia! I like your Mysterious Japan blog as well! You are very welcome, Zack. (Sorry this post is coming so late.) Glad to meet a another who enjoys Japanese culture. This website ROCKS!!! If i want to know something about Yokai stories I come here! Arigatō!!! Thanks Hanyo! Comments like that keep me going! I’m so glad that you enjoyed reading the articles on my site. I have been interested in Japanese Culture, History and Mythology since I lived in the Tokyo area several years ago. I would be interested in reading any information on these subjects that you have online. At present I am writing a series of fantasy action adventure books that take place in feudal and modern day Japan. The series is entitled Legends of the Hengeyokai. Book One: Tengu Prince is currently available at https://www.smashwords.com/books/view/54992. This is an excellent site! Say, will you be posting stories of the Ehon Hyaku Monogatari by takehara shunsen? I would like to! It is all a matter of finding time and balance between the translations I get paid for, and my hobby stuff like this. But I love Ehon Hyaku Monogatari series, so … someday! I watched recently anime series called “Requiem from the Darkness” (wiki has good article). As I suggest, it’s based on kaidans, but I cannon find the ones. Could you name few? It’s interesting to read the original stories. Or are the anime stories completely invented? Sorry for my English, if bad. I haven’t heard of that before, but it looks very cool! I read the Wikipedia, and the kaidan aren’t original stories, but they also aren’t based on anything specific. Most of them are just yokai from Japanese folklore. You can find explanations of several of them here, and some stories. Just search by the yokai name and you should find them. As I understand the anime-stories aren’t based on specific kaidans. The only borrowing from folklore are yokai, not plot. So the anime creators just took yokai and wrote stories about them, right? Thank you very much Zack for all your output on japanese folklore. I published a little book on yōkai conmected to tattooing this year and blogs like yours are invaluable for us westerners. It’s been a great source of inspiration and knowledge to deepen my research on the subjects.